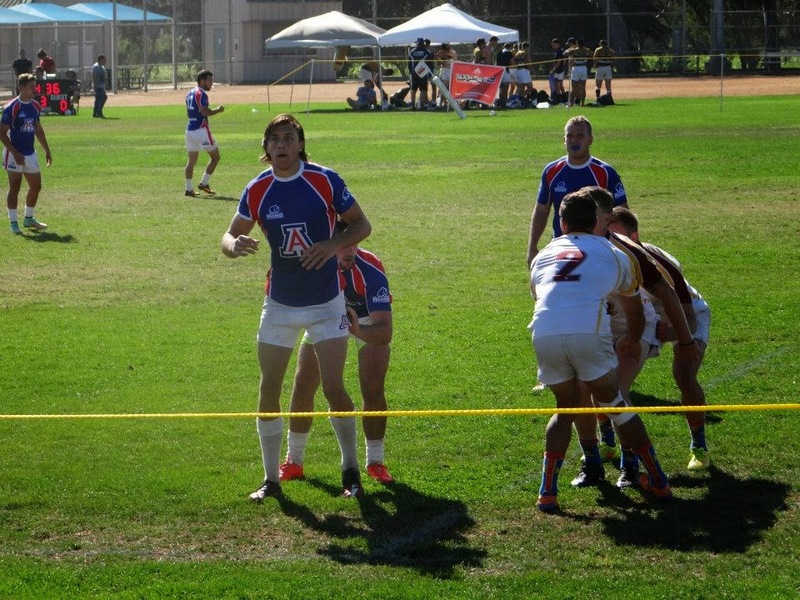 October 11th 2014 saw a strong ASU team compete at the West Coast 7's. ASU's growing prowess at 7's is beginning to get noticed. Coming off the back of a dominant victory the week before where ASU beat four SoCal teams in a 7s scrimmage tournament, including beating last year’s West Coast 7's winner, 28 to 5. It was bound to be a tough day out with tournament favorites, UCLA, Cal Poly, St Mary’s and Cal Bears also present. ASU has improved since last year where they finished 12th nationally and should be taken seriously as contenders this year. Their coach, Ian Gregor, has done an outstanding job with the team, developing their new talent and combining it with their more experienced players. "We have high goals and feel that we can reach them if we stay healthy and focused" said Coach Gregor. Three minutes into the UCLA match one of his players got carded. ASU was leading against UCLA at times, with only 6 players for 11 minutes of the game. However, UCLA chipped away and went on to beat ASU 22 to 14, then ultimately went on to win the tournament against a difficult Cal Bears team. ASU then beat St Mary’s in a close semi-plate match, then went on to beat in-state rival U of A 29 to 0 for the Plate Trophy. Overall ASU went 3-1 on the day. The other team from Arizona to compete was Grand Canyon University who beat UC Davis 21 to 5 for the Bowl Trophy. "Andy and Cal Poly did a great job! It was a great event and looks like there will be tough competition this year," added Gregor. "Standards are improving overall and its making everyone better." The next big match up will be October 25th and 26th at Treasure Island for The Battle of the Bay. Good luck to ASU!